These books by Kagero on warships are subtitled "Super Drawings in 3D", and believe me they are exactly that.The book starts with a short biography of the ship, but the book's main contents are piece by piece computerized drawings of the entire ship from bow to stern. 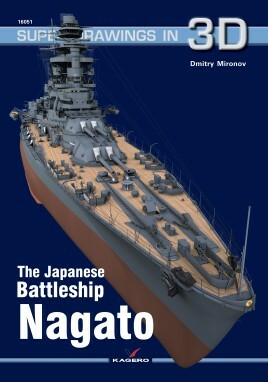 The book also comes with a separate black and white scale drawing of the Nagato. The ship is seen in 1:350th scale, while the main turrets are done in 1:200 scale, and the small guns etc. are done in 1:50th scale. The Nagato was laid down in 1917, and for a few years she and her sister-ship Mutsu were arguably the toughest battleships on the planet. The Nagato's original bow was a problem in heavy seas, and it needed to be completely redesigned. The ship was updated at several times during its career. She was actually the flagship of the Japanese first battleship squadron, at least until the Yamato came along. The Nagato was bombed several times during World War II, but she was one of the few remaining Japanese capital ships to survive the war. The drawings in the book show the Nagato as she looked in 1944. The only thing I would have liked to see added would be to have a few cross section cut-away drawings of the inside of the ship. For the modeller and hobbyist, this book and Kagero's numerous other naval books are a gold mine of information.